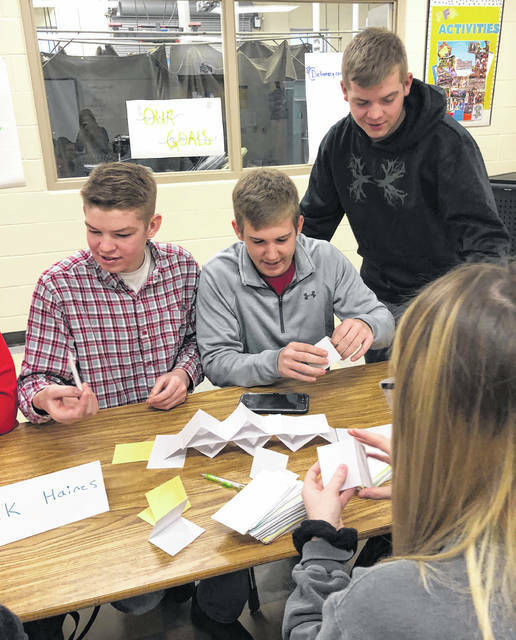 Pictured, from left, are Hillsboro FFA members Brock Haines, Grant Crum and Brennen Priest doing leadership activities. The Hillsboro FFA Chapter recently had the 2018-20 Ohio FFA sentinel from the state FFA officer team, Mallary Caudill, at its school for a workshop day. Caudill spent all day talking to students about being a great influence, reaching your goals and getting past obstacles. One question Caudill had for the classes was: “If no one could see, no one could see if you could dunk being 5’2, no one could see the type of shoes you have or car you have, how would people imagine you?” She also had everyone set a goal for 24 hours from that question to figure out how could they help someone. It was a great day and everyone learned great ways to be a great influence and reach their goals. Submitted by Jordan Williamson, Hillsboro FFA.